Thanet’s Tourism Superstar Stephen Darrer, of Cliftonville Townhouse, is hoping to now go forward and claim the national VisitEngland title. The Isle of Thanet News teamed up with Thanet council’s tourism team to find that special person who consistently goes the extra mile to deliver excellent customer service and to make a holiday experience to remember for visitors. Stephen was named Thanet’s superstar after gaining a whopping 62% of the public vote. He was nominated for extra special touches provided to guests. These included creating a hand-drawn map of the area highlighting where guests could go out and taste the best that Thanet has to offer, from the local produce at Quex Barn, to seafood at Hantverk and Found and afternoon tea on the Walpole Bay terrace. 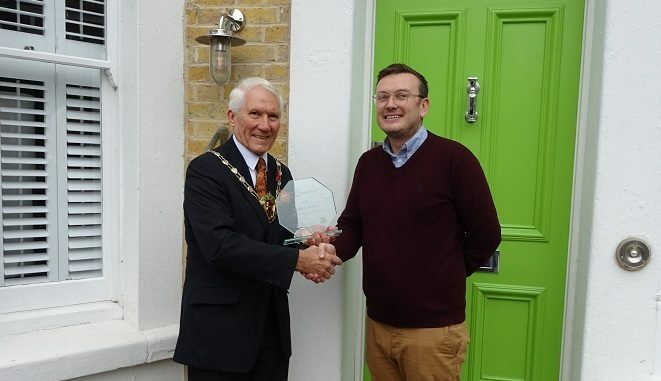 Stephen, who is also the secretary of GRASS, a local community street scheme, received his Thanet Superstar award from Thanet council chairman David Saunders. He is now nominated by VisiThanet to go through to the national stage of the awards run by VisitEngland in partnership with the Mirror newspaper. The nomination period runs until December 14 with the successful top ten being notified by December 21. They will then be filmed before the nominations go out to the public vote in February. The winner is announced on April 6, during English Tourism Week. An awards ceremony will be held in London on April 7. Last year Thanet’s Sam Watling, from Revolution skatepark, narrowly missed taking the Tourism crown after being pipped to the post by a dancing ferry man. So pleased that Stephen Darrer is Thanet’s Tourism Superstar and gone through to the National awards. A complete professional who intuitively knows how to bring a high standard of personal customer service to everyone he interacts with, whether they are his guests or the service providers he engages, Stephen truly is a Superstar and a leader in his industry.